Kerrzy's Notebook: Kerrzy's Notebook: Pit Stop Redemption! It's not your traditional rags-to-riches sports story, but I had some fun on Thursday afternoon after the Capital Ex parade and became just a little bit more manly than I was when I woke up on that fateful day. 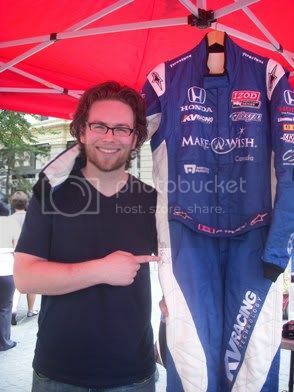 I was asked by my boss to take part in the "Honda Edmonton Indy Media Pit Stop Challenge" in the heart of the downtown - an event put together by Honda and the Make-A-Wish Foundation. Now, before we even get to the event itself, lets talk about the journey there. Forgetting that it was parade day, I drove up and down trying to find a damn parking spot, and eventually ended up with half of my car on the grass in a makeshift parking spot next to some other people (which I paid for!). I ran down the sidewalk to try and make it to Rice Howard Way by 12:30 and suddenly realized I'd have to cross the parade route to get there - which, thankfully, other people were also doing at the time. Here's how it worked: There was a tire mounted on this wall and you had to get the nut off with the torque-gun thing, put the tire down, pick up another tire and screw the nut back on with the gun thing. Yes, the gun thing. I'm very good with cars if you didn't know. After watching the first few people have a go, it was finally my turn. 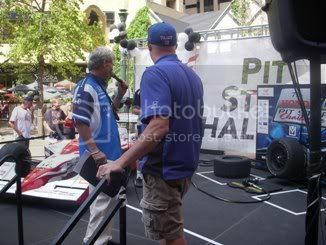 With the emcee of the event and Canadian Indy Car driver Paul Tracy watching on, I proceeded to totally bung it up and register a time of well over a minute - far longer than anyone else. They all had a good laugh at my expense and I hoped really hard that the ground would swallow me up, or that something crazy would happen nearby that we could all turn our attention to...but that didn't happen. Instead, I watched the rest of the participants go through the motions and waited to re-embarrass myself during round two. In the second round everyone was better, including myself as it turned out. When my turn came around, I got down in front of that tire and torqued the heck out of it, cutting my time by well over half! That was nice, but I was still pretty thoroughly embarrassed by my first-round flop and Tracy was long-gone by the time I got up on stage for the second time - but he'd factor in the story a little later on. Once everyone was done, they tabulated the scores and we all lined up for a group picture and the presentation of the first, second and third place trophies. To be honest, I can't really remember who came in second or third, because when it came time to hand out the first place trophy, they said MY NAME! Imagine that! From total loser to tire changing phenom, all in the span of about half an hour. For all my hard work, dedication and perseverance, I was presented with a trophy and got to sign Paul Tracy's racing uniform, which (they say) he'll be wearing this weekend. Even better, I got to cross something off of my "bucket list" - along with a guy from Honda, I got to hand someone a giant, novelty cheque! It was definitely all for a good cause - $1,000 to the Make-A-Wish Foundation, $1,002 if you count my little pre-competition donation. 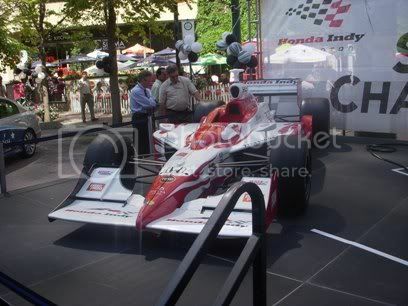 From there I had to rush away to a media availability for a few Indy drivers over at the City Centre Airport - one of whom was Mr. Paul Tracy. I could see a little smirk on his face when I leaned in to ask my question, then he nailed me with this: "I'm glad you're not doing my pit stop!" Ahhhhh good times. Are you heading to the race this weekend?